Oregon-based Gerding Edlen is developing the project on behalf of the state’s largest private landowner, which also will include 280 parking spaces. Keauhou Lane will include a blend of studios, one-bedroom and two-bedroom rentals aimed at individuals and families earning up to $67,000 annually and $95,000 annually, respectively. A key part of the project will be the pedestrian paseo that will connect Keauhou Lane and Keauhou Place residential lobbies, the various restaurant and retail establishments and the Honolulu Authority for Rapid Transportation’s new civic center station. 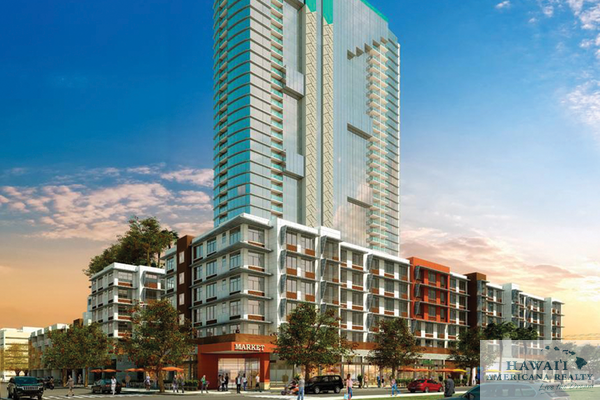 Stanford Carr Development’s Keauhou Place, which is located on the same block at 500 South St. and 500 Keawe St., includes 388 residential units in a 400-foot tower, along with 35 townhome units in a 42-foot mid-rise tower. The project, which includes a rail transit station, has already started construction. Keauhou Lane is in the process of obtaining LEED for Homes Gold certification. Both projects are expected to be completed around the same time, which is roughly the second or third quarter of 2017. Portland, Oregon-based Gerding Edlen is developing the project on behalf of the state’s largest private landowner. Carr’s Keauhou Place, which is located on the block at 500 South St. and 500 Keawe St., includes 388 residential units in a 400-foot tower, along with 35 townhome units in a 42-foot mid-rise tower. The project, which includes a rail transit station, has already started construction. Keauhou Lane, being developed by GE Hawaii Block A2 LLC, includes 209 affordable rental housing units and about 32,300 square feet of restaurant and retail space, according to the project’s recently released draft environmental assessment. The six-story building will consist of 51 studios, 86 one-bedroom units and 72 two-bedroom units. All 209 units of the project will be reserved for residents making up to 100 percent of the area median income, which comes out to $1,677 or less per month for a studio, $1,797 or less per month for a one-bedroom unit and $2,157 or less per month for a two-bedroom unit. The project will involve funding from the Hawaii Housing Finance and Development Corp.
“The project is an essential component in providing critical affordable rental housing inventory within this rapidly growing population center,” the project’s draft EA said. 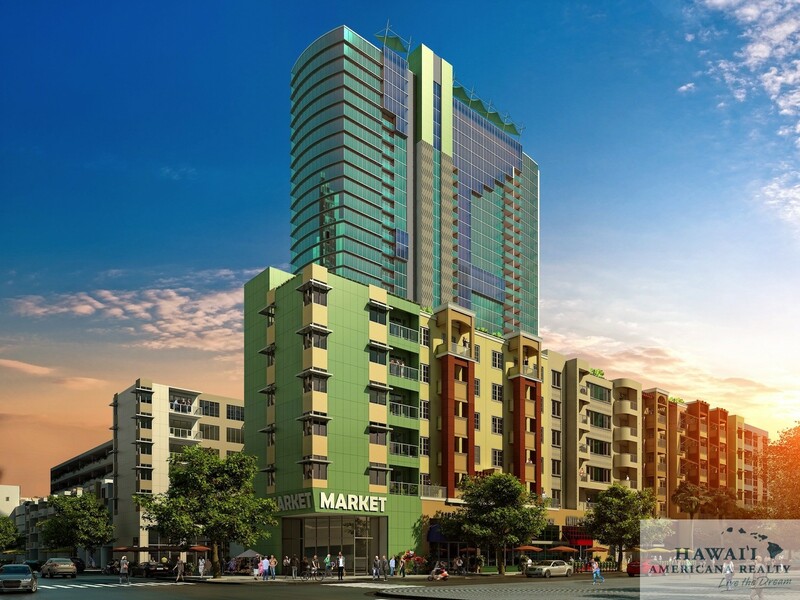 “This project will also fulfill the reserved housing obligation and mix of uses required by the Hawaii Community Development Authority, the state agency regulating development in Kakaako. 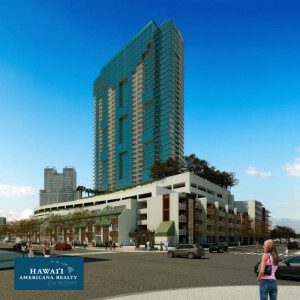 Hawaii developer Stanford Carr’s Keauhou Lane project, which includes 388 residential units in a 400-foot high-rise tower, along with 35 townhouse units in a 42-foot mid-rise tower, is slated to start construction in late March or early April, the developer told PBN Tuesday. Alakea Design Group and Richard Matsunaga & Associates are the architects and Hawaiian Dredging Construction Co. Inc. is the general contractor for the project. In an exclusive interview with PBN on Tuesday, Carr talked about how he feels the transformation of the Honolulu neighborhood of Kakaako is going, as well as updates on his projects across the state, including Keauhou Lane. A sales office for the project recently opened at a former U.S. Department of Housing and Urban Development office at Waterfront Plaza in Downtown Honolulu. Sales of Keauhou Lane, which will include a Honolulu rail transit station, are expected to begin the first of January. “We’re closing on our construction loan [soon], and we’re already going for [building] permits,” Carr said. The block at 500 South St. and 500 Keawe St., includes a project being developed by Oregon-based developer Gerding Edlen on behalf of landowner Kamehameha Schools. That project includes 209 residential units in a 65-foot mid-rise building and 39,145 square feet of ground-floor commercial space. “There’s already pent-up demand from the last four years, starting in 2008,” Carr said of the housing market in Hawaii. “What The Howard Hughes Corp. is offering satisfies a sector, what [Alexander & Baldwin Inc.], us and Marshall Hung are offering also satisfies a sector of the market. 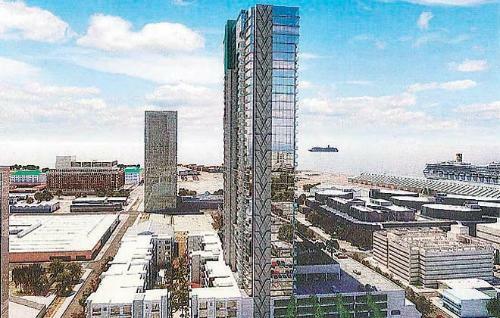 A rendering of the proposed Keauhou Lane project in Kakaako. The Hawaii Community Development Authority, the state agency regulating development in Kakaako, voted 8-0 Wednesday to approve the Keauhou Lane project, which features a 43-story condo tower, 632 residential units, parking for 1,038 cars and about 39,000 square feet of restaurant and retail space on a 4.2-acre block bordered by South, Pohukaina, Halekauwila and Keawe streets. Wednesday’s vote is the final approval the project needs from the HCDA. The developer still needs building permits and expects to start construction next year. The land is owned by Kamehameha Schools. Stanford Carr, a local developer, is in charge of the tower and parking portion of the Keauhou Lane project. The 43-story tower at Keauhou Lane is designed with 388 condos. Another 35 town homes would line the parking garage along South and Pohukaina streets. The project also includes apartments and retail space, which are being developed by Portland, Ore.-based Gerding Edlen and will feature 209 rentals in four six-story buildings on the Keawe Street side of the block. The Hawaii Community Development Authority has approved two Kakaako residential projects being developed by Hawaii developer Stanford Carr and Oregon-based developer Gerding Edlen on the same block totaling 632 units. Keauhou Lane’s portion of the project at 500 South St. includes a mix of 388 residential units, which will have one-, two- and three-bedroom units in a 400-foot high-rise building, along with a mix of 35 townhouse units that will have two- and three-bedroom units in a 42-foot mid-rise tower, as well as 2,854 square feet of ground-floor commercial space, 1,038 square feet of vehicle stalls in a 72-foot parking structure, about 13,000 square feet of open space and 31,400 square feet of recreation space. The Gerding Edlen project at 500 Keawe St., which is being developed on behalf of landowner Kamehameha Schools, includes a mix of 209 residential units that will have studio, one- and two-bedroom units in a 65-foot mid-rise building, 39,145 square feet of ground-floor commercial space, four loading stalls, about 13,600 square feet of open space and 11,500 square feet of recreation space. The request was for a joint development permit for two separate mixed-use residential, commercial/retail development projects being built at the same time by Carr and Gerding Edlen. Keauhou Lane requested a modification from the mauka area rules to increase the podium’s height to about 72 feet and cause a partial obstruction of the South Street view corridor, while Gerding Edlen asked for a modification from the same rules to increase the podium’s height to about 65 feet. Meantime, also at Wednesday’s meeting, the HCDA, which oversees the redevelopment of Kakaako, held an initial public hearing for Castle & Cooke and Kamehameha Schools’ 183 rental and for-sale workforce housing units located on the block bounded by Auahi, Keawe and Pohukaina streets. Seven members of the public testified in support of the project and one person testified in opposition, said HCDA spokeswoman Lindsey Doi. The project’s second public hearing will be held on June 10 with a decision-making hearing scheduled for July 9. The two private developers are requesting a joint development permit for their two separate mixed-use, residential, commercial/retail projects. The projects will be built simultaneously, with construction starting later this year and completion targeted in 2016. Castle & Cooke and Kamehameha Schools are asking for a modification to increase the area’s building height restriction from 45 feet to 65 feet. Portland-based Gerding Edlen Development will develop a 209-unit workforce housing project adjacent to Stanford Carr Development’s Keauhou Lane project on South Street in Kakaako. The Hawaii Community Development Authority has scheduled public hearings in March and April for two planned Kakaako residential projects that sit on the same parcel. One is at 500 South St. — Hawaii developer Stanford Carr’s Keauhou Lane project — and the other is at 500 Keawe St. — Oregon-based developer Gerding Edlen’s project. The first public hearing at 9 a.m. Wednesday, March 19, will give developers an opportunity to officially present their plans. The second hearing, which is scheduled for 9 a.m. Wednesday, April, will give the public another opportunity to voice their opinions about the project with the possibility of the HCDA making a decision at that time. Both hearings will take place at the HCDA’s office at 461 Cooke St. in Honolulu. The request is for a joint development permit for two separate mixed-use residential, commercial/retail development projects being built at the same time by Carr and Gerding Edlen. 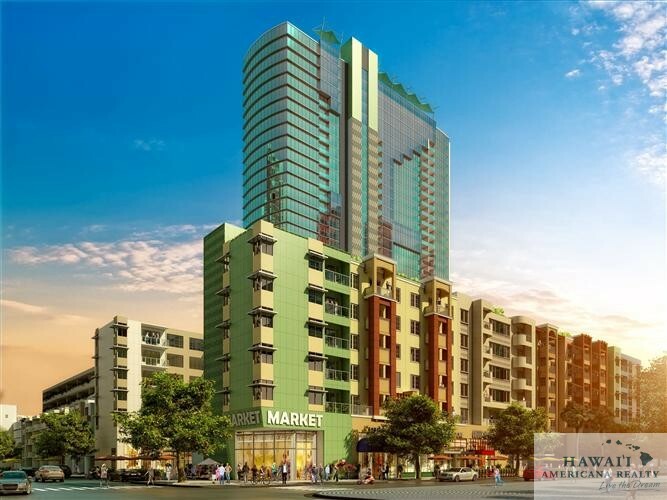 Keauhou Lane’s portion of the project includes a mix of 388 residential units, which will have one-, two- and three-bedroom units in a 400-foot high-rise building, along with a mix of 35 townhouse units that will have two- and three-bedroom units in a 42-foot mid-rise tower, as well as 2,854 square feet of ground-floor commercial space, 1,038 square feet of vehicle stalls in a 72-foot parking structure, about 13,000 square feet of open space and 31,400 square feet of recreation space. 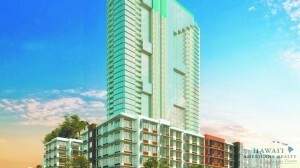 The Gerding Edlen project, which is being developed on behalf of landowner Kamehameha Schools, includes a mix of 209 residential units that will have studio, one- and two-bedroom units in a 65-foot mid-rise building, 39,145 square feet of ground-floor commercial space, four loading stalls, about 13,600 square feet of open space and 11,500 square feet of recreation space. Off-street parking for the project is expected to be provided in a parking podium constructed as part of the Keauhou Lane development with facilities such as loading areas, open space and recreation space being shared between both projects. Keauhou Lane is requesting a modification from the Mauka Area Rules to increase the podium’s height to about 72 feet and cause a partial obstruction of the South Street view corridor. Keauhou Place – 555 South St. The project, part of Kamehameha Schools’ extensive Our Kaka‘ako master plan, will be constructed at 555 South St., the parking lot where Eat the Street now takes place. Keauhou Lane — located on the block bound by South, Halekauwila, Keawe and Pohukaina Streets — will break ground sometime in late 2014 and take appromixately 15-20 months to complete. The neighborhood will feature walkable “complete streets” part of a new urban neighborhood vision of Kamehameha Schools. The redevelopment of the entire 9 Block neighborhood will take place over 15-20 years. Stanford Carr will develop approximately 93,000 square feet of the property, including a 40-story tower called Keauhou Place (with 400+ residential units), as well as a parking structure for all uses on a block that will be lined with some 35 townhomes along South and Pohukaina streets. Kamehameha Schools, meanwhile, will develop about 70,000 square feet of the property, including some 150-170 live-work units and rental apartments, along with ground floor retail spaces. “Developer Stanford and Kamehameha Schools on Friday formally announced plans for Keauhou Lane in Kakaako, a project that includes a 40-story tower consisting of 600 residential units as well as a low-rise mixed-use residential project with 200 workforce rental apartments. The $300 million project, which will be located on the site of a surface parking lot along South Street, adjacent to Carr’s Halekauwila rental project and bounded by Halekauwila and Pohukaina streets as well as South and Keawe streets, includes a variety of housing options such as rental apartments, lofts, townhomes, a high-rise tower and live-work space and retail shops and a neighborhood grocery store. 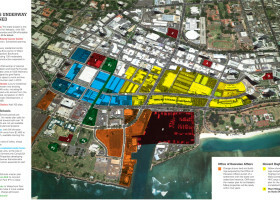 Carr’s Stanford Carr Development would develop the 600 units in the tower, while Kamehameha Schools would develop the workforce rental apartments. Governor Abercrombie, Kamehameha Schools, and Stanford Carr Development announced a new mixed-use Kaka‘ako residential project today. An estimated 40 percent of the housing units at Keauhou Lane will be reserved for middle-income workers. Renters can earn up to 100 percent of Honolulu’s median income, and fee simple buyers can earn up to 140 percent to qualify. 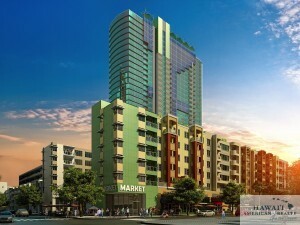 Overall, the project is being designed for the local market. Offering a wide selection of well-priced units, Keauhou Lane will provide a variety of choices for individuals, couples and families interested in living within one of urban Honolulu’s most exciting new mixed-use neighborhoods. It is located on the block bound by South, Halekauwila, Keawe and Pohukaina Streets, also known as “Block A” of the Kamehameha Schools’ Our Kaka‘ako master plan. Development work for Keauhou Lane will be a collaboration between Stanford Carr Development and Kamehameha Schools. 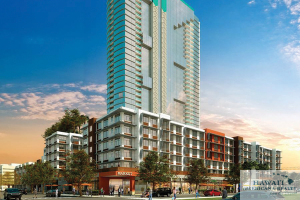 Stanford Carr’s portion will comprise approximately 93,002 square feet of the property and include a 40-story tower called Keauhou Place, as well as a parking structure for all uses on the block that will be lined with townhomes along South and Pohukaina Streets. Kamehameha Schools’ plans for approximately 69,387 square feet of the property include live-work units, rental apartments and ground floor commercial. Combined, the projects are anticipated to contain almost 50,000 square feet of recreational spaces for the project residents, as well as over 65,000 square feet of open spaces, including fully landscaped sidewalk areas enhanced with features consistent with the City’s “complete streets,” making KS’s overall vision of a walkable neighborhood come to life.